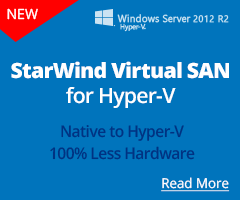 StarWind offers for Microsoft Certified Trainers (MCTs), Most Valuable Professionals (MVPs) and Microsoft Certified Professionals (MCPs) the 2-node fault-tolerant FREE version of StarWind Virtual SAN for Hyper-V. It features unlimited served capacity and runs on a minimalistic (just 2 hosts) hardware profile without any ties to hardware brand. All VMware users can download the 2-node fault-tolerant FREE version of StarWind Virtual SAN for vSphere. It installs on top of the existing two free or licensed vSphere hosts, clustering them and creating a virtual SAN by "mirroring" DAS. The free version features unlimited capacity and runs on a minimal (just 2 hosts) hardware profile without vendor lock-in.